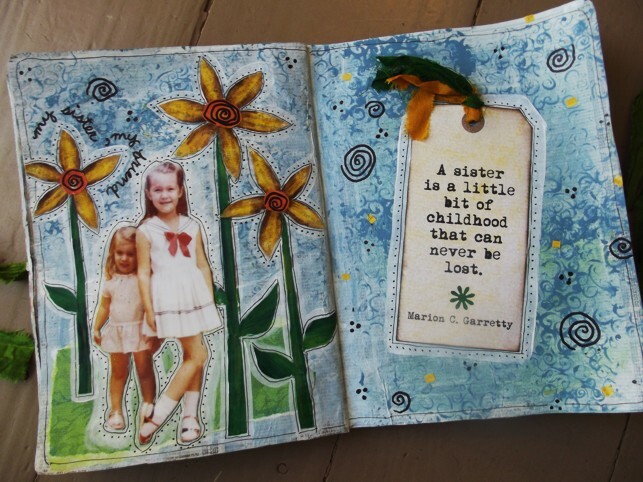 Today I'm excited to share my latest journal page and wish my little sister a very happy birthday! I have three sisters and all of our names begin with J. Anyone who knows us even a little knows that we are j's 1,2,3 and 4. I am j3 and Jill, whose birthday is today is j4. Jill came into my life when I was just two years old so I don't remember this world without her. 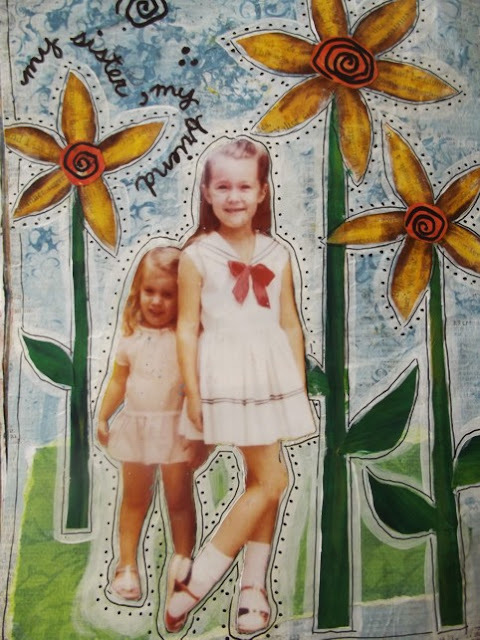 The picture I used for today's journal page was taken as I was leaving for my first day of kindergarten. I wonder if Jill wanted to go with me that day. We would have had a blast in the kitchen center! My little sister and I did everything together when we were young. We laughed, we fought, and we put on countless "shows" for our big sisters and our parents. Every summer morning we made mud pies for our playhouse bakery and we spent entire afternoons pretending we were being chased by "the robbers" who were trying to harm our twin baby girls (our matching Baby Tender Loves). Somehow we always made a narrow escape in time for dinner. It was really quite magical. Life was simple and beautiful. We had no idea how complicated things would get as we grew up. We had no idea I'd get married and move thousands of miles away. We had no idea how many months of her life Jill would spend in hospitals because of a respiratory condition. We had no idea how hard so much of it would be but looking back I see how rich it has been as well. The hardships have helped us treasure the good times and we've learned to look for beauty in unexpected places. have known struggles, have known loss, and have found their way out of the depths. 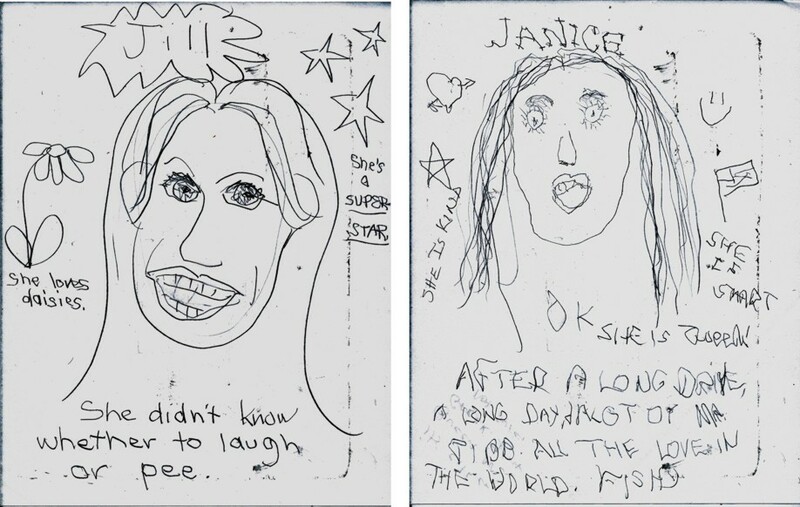 Recently Jill and I amused ourselves one night in her hospital room by drawing left-handed portraits of each other. As you can see, we are both most definitely right-handed. I have to say, it is amazing that she captured such a great likeness of me since she had an oxygen sensor on one of her fingers at the time. We laughed hysterically. We laughed because the drawings were so silly, then we laughed even more because we needed so much to feel joy and to be okay with life as it was just at that moment. Laughter is such a powerful weapon. Absolutely priceless. So beautiful! Thanks for sharing! Janice, there is nothing like having sisters (I have two). Thank you for sharing this personal post. I love your art- the flowers are fun :) The way you incorporate the quote is really lovely too! Thank you for your sweet words, Melissa. You're right about having sisters. I can't imagine my world without them! What a wonderful blog post. I laughed when I saw your left-hand drawings of each other. What a great way to have fun. Loved the beautiful celebration of your sister. Hi, Suzanne! Those drawings were so fun and silly. My sister and I made some sweet memories that night. Thanks for stopping by. Very touching and very inspiring! You both sound like very special women. Thank you, Gail. It's kind of you to say so. Janice, what a great post, sisters are so special aren't they?? 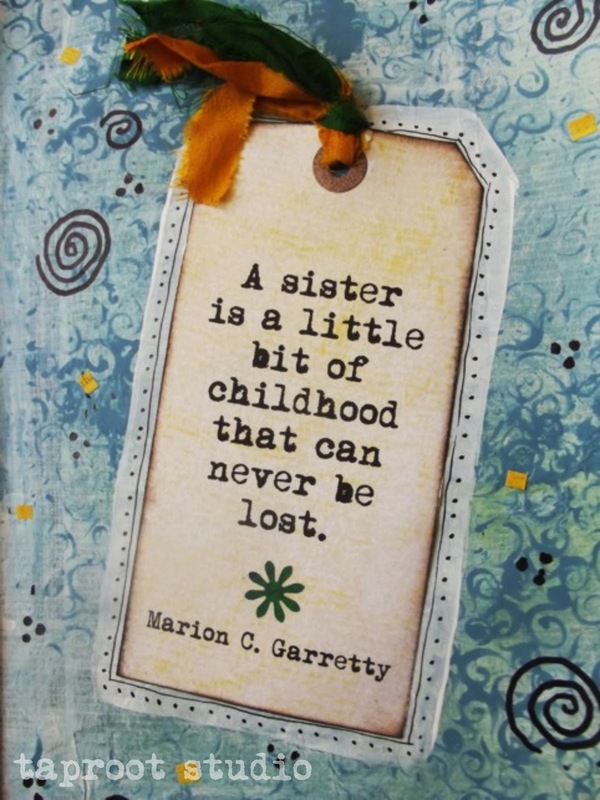 Yes, sisters are VERY special! Thanks for stopping by, Sue. Have a great week! What a beautiful blog post =). 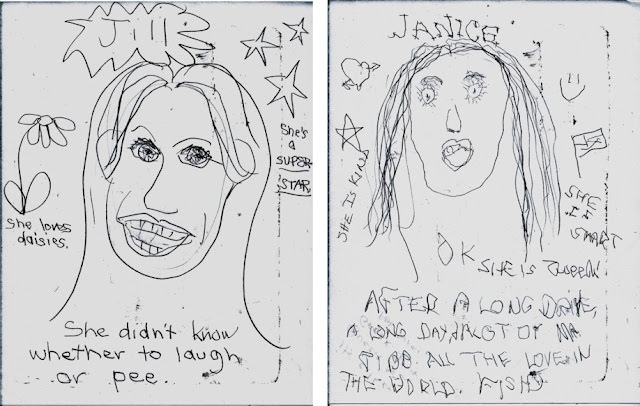 I love the pictures you and your sister drew -- there is no such thing, in my book, as too much laughter! By the way, if you did the lettering left-handed on the picture you drew, I've gotta say I'm pretty impressed -- my handwriting with my good hand is not even that neat ;-). Thank you for visiting my blog! I'm looking forward to following yours as we continue AEDM (and after that, as well). 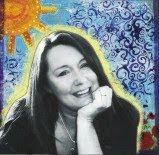 I love your blog, Glenda! I'm so glad to have found you through AEDM! Oh, Babbie, I am so sorry about your sister. I can't imagine what it was like for you to lose her. Yes, sisters are truly a blessing and the only thing that is sure is this very day, this very moment. I'm so glad you joined our blog circle. I'm really looking forward to getting to know you better.